Please read on below for more information on our captive pin long dee shackle. Alternatively, please scroll to the bottom of this page where you will find our contact details to place an order. This product is extremely similar to our other long shackle equipment range. They are still long in nature, and we can provide them in up to lengths of 70mm. They still also resemble the D shape commonly found with all dee shackles. 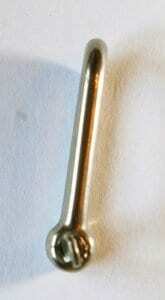 The key difference with this product is the fact that they have a captive pin. This will be that the pin has been mated to the shackle itself, sometimes using a wire. This will mean that the pin is a non-removable bar. We find that this makes it a perfect combination for a halyard in the marine industry. Typically, this halyard rope will be spliced directly onto the shackle itself. Like our other range of shackles, it will still have the same core qualities; being constructed from robust stainless steel, offering a good level of resistance to corrosion and chemicals, and will be incredibly strong in nature. Other steels available. We can finish our shackles off in a range of ways, including; hot dipped galvanisation, electro-galvanisation, painted or self-coloured. If you would like to place an order for this equipment, please either give us a call on 01384 78004, or get in touch with us here. 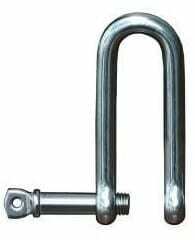 Stainless Steel Captive Pin Long Dee Shackle Overall rating: 5 out of 5 based on 6 reviews.